Fibromyalgia is a rheumatic disease. Typically, it occurs at the age of 25 to 60 years. It occurs more often in women than in men. The muscles feel as if they are overwhelmed by heavy physical activity without a clear reason. Sometimes the muscles are tense, “burning”, or painful. Pain in fibromyalgia is very specific – it is felt throughout the body, both in the left and right half, under and over the waist, in the middle or low in the back, chest, and neck. Specific points on the body are affected, at the pressure of which the patient experiences severe pain. It is believed that the pathogenesis of the disease is related to an excessive accumulation of certain chemicals – neurotransmitters, in the brain. As a result, there are processes in the nervous system that lead to an increase in the sense of pain. Studies have shown the extremely low levels of hormones – serotonin, noradrenaline, and dopamine. This explains the occurrence of disorders in sleep, appetite, mood, and the reactions of the patients in stressful situations. Diagnosis of fibromyalgia is based on the patient’s history and examination. Practice shows that often the disease remains unrecognizable. In order to exclude the possibility of another illness, a number of studies have to be made – complete blood test, blood sugar, thyroid hormones, etc. It has to be considered the fact that the symptoms of fibromyalgia persist for at least three months. There is no specific treatment. A good influence on pain, feeling of fatigue, and on the improvement of cognitive function has the use of analgesic agents from the group of non-steroidal anti-inflammatory and opioid analgesics as well as treatment with antidepressants and antiepileptics. To control stress, it is also appropriate to conduct cognitive-behavioral therapy. Multiple sclerosis (MS) is a chronic inflammatory autoimmune disease. Symptoms usually occur between the ages of 20 and 40 years. Women develop multiple sclerosis more often than men. The MS is characterized by demyelination plaques, scattered in the white matter of the brain and spinal cord. In MS, within a faulty immune system response, tissue belonging to the body is recognized as a foreign one and attacked as such. An inflammation reaction that leads to myelin injury develops. Inflammation damages myelin and oligodendrocytes – cells in the central nervous system responsible for the production and maintenance of the myelin coverage of the axons. The demyelinated axons cannot effectively carry out nerve impulses. The performance of nerve impulses is delayed and sometimes even blocked. Thus, MS affects the ability of the brain to control functions such as vision, walking, talking, etc. The process of diagnosing MS begins with the exclusion of other possible diseases. No single test alone is a conclusive evidence of MS. Therefore, the diagnosis should be a combination of history, neurological status, and test results. Fibromyalgia: Fibromyalgia is a chronic rheumatic condition, causing pain in certain body parts. MS: Multiple sclerosis is a chronic degenerative disease of the central nervous system. Fibromyalgia: Fibromyalgia typically occurs at the age of 25 to 60 years. MS: Multiple sclerosis typically occurs at the age of 20 to 40 years. Fibromyalgia: The main symptoms of fibromyalgia are increasing pain or sensitivity at certain points of the body, unreasonable and uncontrollable feeling of fatigue, depression, anxiety, etc. MS: The symptoms of Multiple sclerosis include sensory disorders, symptom of lhermitte, visual disturbances, motor disorders, pareses, changes in muscle tone and coordination, acute or chronic pain, fatigue, etc. Fibromyalgia: The pathogenesis of the fibromyalgia is related to an excessive accumulation of neurotransmitters in the brain. This leads to an increase in the sense of pain. MS: In Multiple sclerosis, within a faulty immune system response, tissue belonging to the body is recognized as a foreign one and attacked as such. An inflammation reaction that leads to myelin injury develops. Fibromyalgia: The risk factors associated with unlocking the fibromyalgia are a strong stressful situation, physical trauma, surgical intervention, genetic predisposition. 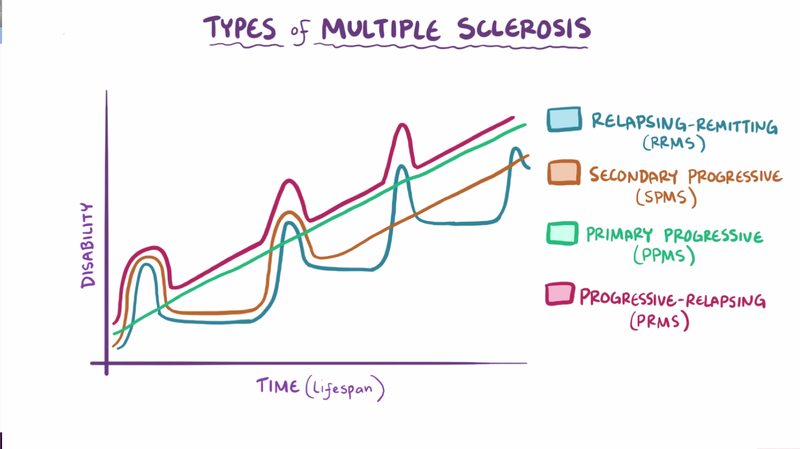 MS: A combination of multiple factors is responsible for the development of Multiple sclerosis, such as environmental factors, hereditary factors, autoimmune disease. Fibromyalgia: Diagnosis of fibromyalgia is based on the patient’s history and examination. In order to exclude the possibility of another illness, a number of studies have to be made – complete blood tests, blood sugar, thyroid hormones, etc. MS: No single test alone is a conclusive evidence of Multiple sclerosis. Tests needed to diagnose are magnetic resonance imaging, evoked (induced) potentials, lumbar puncture. Fibromyalgia: There is no specific treatment for fibromyalgia. A good influence on pain, fatigue and cognitive function has the use of non-steroidal, anti-inflammatory, and opioid analgesics as well as treatment with antidepressants and antiepileptics. To control stress, it is also necessary to conduct cognitive-behavioral therapy. MS: A number of medications affect the symptoms of MS or alter the severity and frequency of seizures. These are corticosteroids, immunomodulators, and immunosuppressants. Fibromyalgia is a chronic rheumatic condition, causing pain in certain body parts. MS is a chronic degenerative disease of the central nervous system. Both fibromyalgia and MS occur more often in women than in men. Fibromyalgia typically occurs at the age of 25 to 60 years, MS – at the age of 20 to 40 years. The main symptoms of fibromyalgia are increasing pain at certain points of the body, unreasonable and uncontrollable feeling of fatigue, depression, anxiety, etc. The symptoms of MS include sensory disorders, symptom of lhermitte, visual disturbances, motor disorders, pareses, changes in muscle tone and coordination, acute or chronic pain, fatigue, etc. The pathogenesis of the fibromyalgia is related to an excessive accumulation of neurotransmitters in the brain, leading to an increase in the sense of pain. In MS, within a faulty immune system response, tissue belonging to the body is recognized as a foreign one and attacked as such. This provokes an inflammation reaction, leading to myelin injury. The risk factors associated with unlocking the fibromyalgia are a strong stressful situation, physical trauma, surgical intervention, genetic predisposition. A combination of multiple factors is responsible for the development of MS, such as environmental factors, hereditary factors, autoimmune disease. No single test alone is a conclusive evidence of fibromyalgia or MS. Diagnosis of fibromyalgia is based on the patient’s history, examination, and blood tests, aiming to exclude other illnesses. Tests needed to diagnose MS are magnetic resonance imaging, evoked (induced) potentials, lumbar puncture. There is no specific treatment for fibromyalgia and MS. 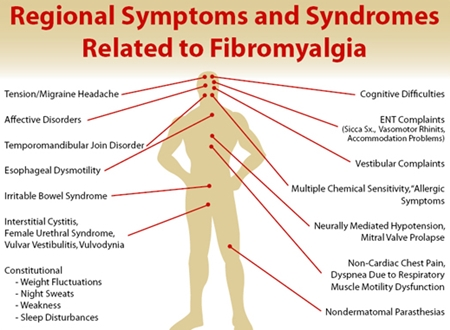 Symptoms of fibromyalgia are influenced by the use of non-steroidal, anti-inflammatory, and opioid analgesics as well as treatment with antidepressants and antiepileptics. The medications that affect the symptoms of MS or alter the severity and frequency of seizures are corticosteroids, immunomodulators, and immunosuppressants. Dr. Mariam Bozhilova Forest Research Institute, BAS. "Difference Between Fibromyalgia and MS." DifferenceBetween.net. April 3, 2018 < http://www.differencebetween.net/science/health/difference-between-fibromyalgia-and-ms/ >. Brockley, A., K. Urdiales. Autoimmune: The Cause and the Cure. Spearfish: Nature Had It First Inc. 2011. Print. Kalb, R., B. Giesser, K. Costello. Multiple Sclerosis for Dummies, 2nd Edition. Indianapolis: Wiley. 2011. Print. Staud, R., C. Adamec. Fibromyalgia for Dummies, 2nd Edition. Indianapolis: Wiley. 2002. Print.